Click the link below for an audio version of this story! It's been three days since the white envelope arrived in Sherri's mailbox. She hasn't eaten since then. She's pulled out her old exercise bike and put it to use, though every time Sherri finishes a workout, her dizziness gets worse. Please join us in celebrating the St. Mary's High School Ten Year Reunion. Let's dance the night away and remember the good old days! Don't high school reunions only happen in the movies? But on Tuesday the invitation was in her mailbox, a white envelope heavy as a stone. When Sherri gets hungry, she pretends to eat air. She takes forkfuls of it and chews slowly. She lies down in the space between her dining room table and the wall. From here she can see a slice of blue sky with patches of slowly-drifting clouds. She notices a small spider in the corner of her ceiling. There aren't any bugs dotting the spider's web. The spider is on an air diet too. or just simply, "fat Sherri." Ten years have passed and the words still shoot holes through her. Her spider looks hungry. She can feel its desperation. Sherri struggles to her feet, and pinpricks of light cloud her vision. Her head spins, and she has to hold on to the edge of the table to keep from falling. On Sunday, Sherri's spider is dead. Its body is curled into a tight little ball, so small you wouldn't notice it if you didn't know it had been there. 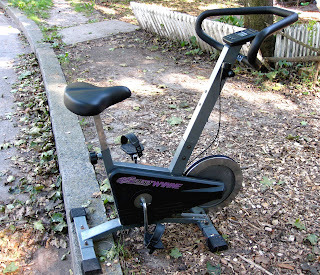 Monday, Sherri drags the exercise bike outside and leaves it by the curb. I love hearing the story out loud. What a treat to be read to. And your reading is excellent. Great job. This one was especially wonderful. I really felt like I could lie there on the floor with sherri cause I didn't have to do the work of reading. thanks for sharing your brilliant work.